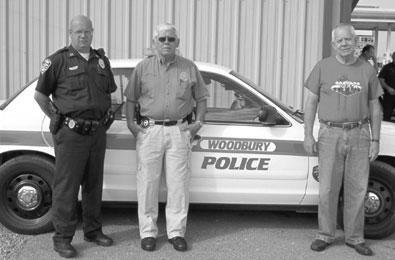 The Town of Woodbury Mayor and Board of Alderpersons voted recently to donate a patrol car to the Sheriff’s Department. Pictured are left to right, Chief of Police Kevin Mooneyham, Cannon County Sheriff Darrell Young and Mayor Harold Patrick. Donated was a 2005 Ford Crown Victoria with only 78,000 miles and will be replacing a 1997 Ford Crown Victoria with 280,000 miles. The car donated by the city is fully equipped except communications radio and even has a video system to record transport of prisoners. The Police Department replaced this car with a 2012 Dodge Charger which has already been put in service.